Despite your best efforts to come up with a unique password for your login - one with letters, numbers, symbols, and a gazillion characters in length, it's still just a single point of entry between a would-be intruder and your sensitive data. If someone can crack your password, every piece of data that you hold near and dear is up for grabs. Universal Shield is the perfect solution for making your data secure. By letting you protect your files, folders, and drives, Universal Shield provides an invaluable layer of added protection for your data! You can have Universal Shield trigger automatically on boot, or after a specified period of idle time. Imagine having the ability to hide individual files, file types, folders, and drives from all other users, including those with administrator privileges! 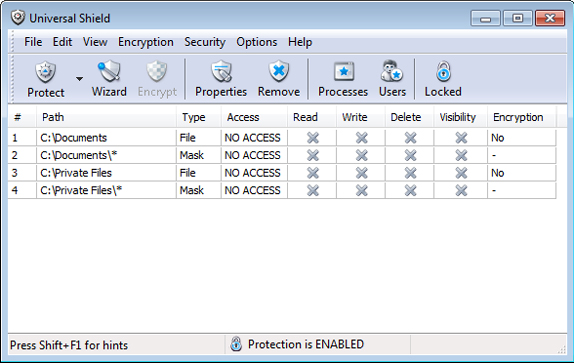 You can even use Universal Shield to encrypt those files, folders, and drives with a password, or limit the Read/Write/Visible/Delete permissions of other users, which is helpful when you want others to view files without giving them the ability to delete them. Universal Shield also protects your personal settings from being modified, so your My Documents folder and Internet Favorites are kept safe from harm, and your desktop icons stay where you put them. What about programs that need access to your protected files, folders, and drives? Universal Shield lets you specify trusted applications that can override the protection! Add an extra layer of security and protection to your files, folders, and drives. Hide confidential information from every other user, including administrators. Encrypt files, folders, and drives. Trigger protection automatically on boot or after a certain period of idle time. Adjust read/write/visible/delete permissions for individual users. Protect your icons and personal settings from being modified. Permit exceptions for specific applications. After you purchase Universal Shield it may be used indefinitely. Universal Shield is licensed per user, so if more people are going to use Universal Shield you will need to purchase additional copies. Email license activation is required with a hardware footprint, and unlimited installations per footprint. what's this? Upgrades to future versions of the software will be free for 12 months. For versions after that, upgrades will require additional payment, which will be discounted by 50%. It will be discounted only if you've purchased the last major version. Peace of Mind for You and Your Personal Data!